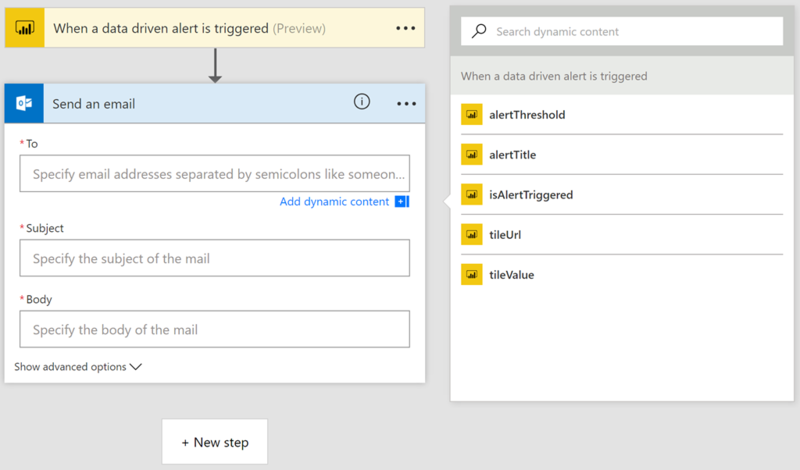 Today, I am happy to announce availability of the Power BI data alert connector for Microsoft Flow. By combining the power of Power BI data alerts with the hundreds of actions available for Flow, we’re making it easier than ever to go from insight to deep, meaningful action. Microsoft Flow is a SaaS offering for automating workflows across the growing number of applications and services that business users rely on. You can set up Flows to take care of the important, repeating tasks that take place daily in your organization. For example, you can create a Flow to text you via SMS when your manager sends you an e-mail marked as “high importance.” Or, automatically create a to-do item in Wunderlist when a customer e-mails your support line. Data alerts are a recently released Power BI feature, which allow you to be notified whenever a tile on your dashboard meets a particular criteria. For example, you can set up an alert to send a push notification whenever tile “Daily Deliveries” > 10000. With this release, we are adding the Power BI data alert connector to Flow. 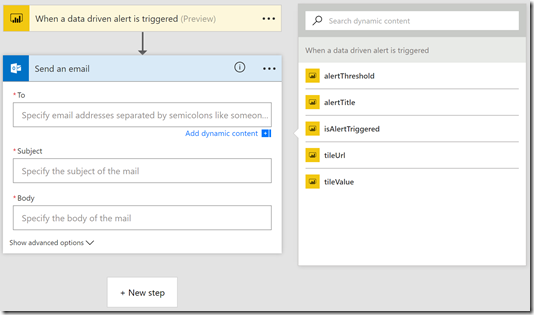 This means that from a Power BI data alert, you can now trigger actions in dozens of other popular apps and services. Send an e-mail to a Security Group with the value of the alert. Post to a Slack channel with a link to the tile. Create a card in Trello based on the alert name. The list of possibilities is expansive, and it’s only getting bigger – new connectors are being added to Flow every week. Ready to get started? What follows is a tutorial walkthrough for setting up your first flow. In this basic example, we’ll send out an e-mail to a broad audience whenever a Power BI data alert is triggered. You could imagine using a similar Flow to notify your support team whenever incident volume spikes. Firstly, go to Power BI and set up a data alert if you haven’t already. If you need help, you can find the documentation for that process here. With the alert set up, go to Flow, and sign in with your Work or school account. The first thing you’ll want to do is create a trigger, which is an event which sets the Flow in motion. Search “Power BI” in the box titled “Search for more triggers”, and select the Power BI data alert option which shows up in the dropdown. Next, select the name of the alert that you’d like to use to trigger the Flow. Now, you’ll want to add an action to be performed when the Flow is triggered. In this case, we’ll add an action to send an e-mail. Click the “+ New step” box below the Power BI trigger to start creating a new option. In the search box, type “Outlook” choose the Outlook “Send an email” action. Note: this tutorial assumes that you have an Exchange Online mailbox. If not, you can also try using the SMTP action, which allows you to send e-mail to any SMTP server. Now, you can populate the fields of the box as you would with any email. Keep in mind that the mail will be sent from your account. Once you are satisfied with your e-mail, select Create Flow in the top bar to create your Flow, and you’re done! The next time this data alert is triggered, the Flow you just configured will activate, sending the e-mail that you configured to your target audience. For more ideas on Flows, check out the Flow templates page to see a gallery of the most popular ideas. We’ve also added several Flow templates with the Power BI connector, including the one featured in the tutorial above. Also, stay tuned to the Power BI blog, as we’ll be releasing something new Flow connectors in the weeks to come. Have an idea for another way that Power BI can connect to Flow? Head to the Power BI UserVoice and cast your vote to make your voice heard. Made a cool Flow? Share it with the community! Either post in the comments below, or in the Power BI forums. Who knows, your Flow might even be featured in the next Power BI Flow blog post!